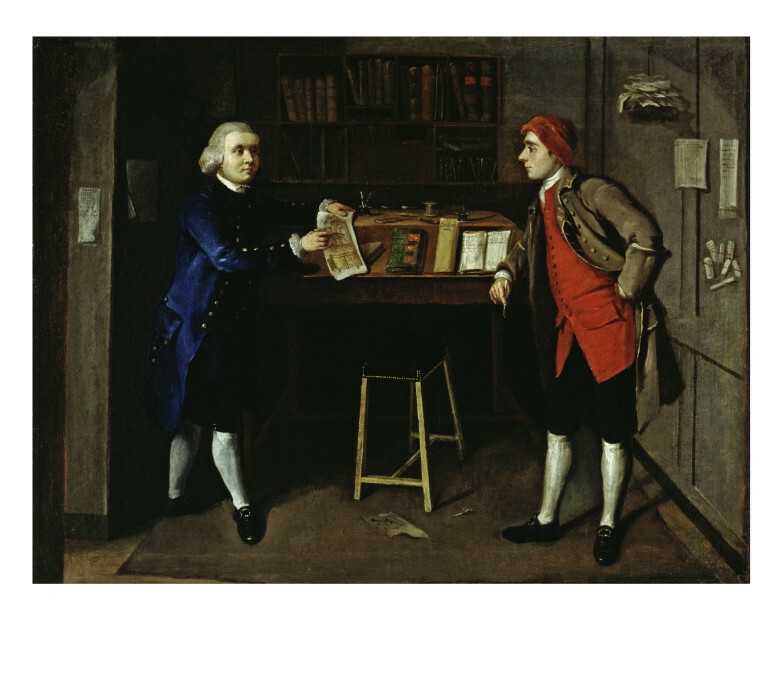 Paintings showing the interiors of offices and workshops are rare in Britain before the end of the 18th century. The increasing number of wealthy manufacturers and entrepreneurs supplying the luxury trades meant that portraits, hitherto mainly the preserve of the aristocratic members of society, were commissioned by wealthy members of a new and burgeoning middle class. Although the conventional studio backgrounds to portraits were still used, sometimes the workshop or the office was employed as a setting by the more confident sitters for the portraits. They were proud of the lucrative businesses they had built up. 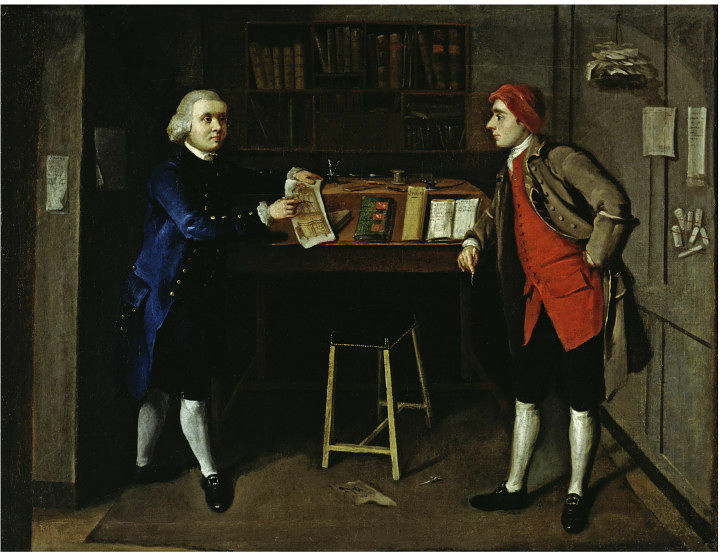 The painting shows a cabinet-maker pointing to a design for a commode and bookcase which has been coloured for presentation to a client. He is leaning on the bookkeeper's desk, which supports the order book and various account books. The figure to the right, pen in hand, is probably the bookkeeper. The simple panelled room contains a desk, stool and plain bookcase for housing the records of the cabinet-maker's business. Only a substantial business, such as that managed by Thomas Chippendale (1718-1779), would require a full-time book-keeper. 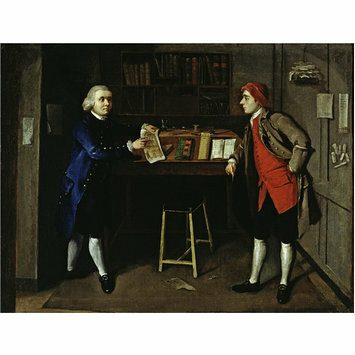 Oil painting depicting two men working in a cabinet maker's office, one displaying a plan or design, and the other looking on, holding a pen. The V&A purchased A Cabinet-maker's Office from a Mr Richard Booth of Brynmelyn, Hay-on-Wye, who was a director of an Oxford firm of art dealers, Bonfiglioli Ltd. Correspondence, dated 20/2/1961, on Nominal file MA/1/B1901 notes that 'the picture was brought in by one of their 'runners', who said that he bought it at the sale of a Welsh solicitor.' No further information on its provenance is given on the file. The V&A acquired A Cabinet-maker's Office from a Mr Richard Booth of Brynmelyn, Hay-on-Wye, who was a director of an Oxford firm of art dealers, Bonfiglioli Ltd., Fine Arts, 36 Little Clarendon Street, Oxford. Correspondence, dated 20/2/1961, Nominal file MA/1/B1901, notes that 'the picture was brought in by one of their 'runners', who said that he bought it at the sale of a Welsh solicitor.' No further information on its provenance is given. The museum acquired the painting in the belief that it would make an interesting connection with the cabinet furniture already in its collection (letter from the Deputy Keeper of the Department of Woodwork, dated 23/2/1961, Nominal file MA/1/B1901). Paintings showing the interiors of offices and workshops are rare in Britain before the end of the 18th century. The increasing number of wealthy manufacturers and entrepreneurs supplying the luxury trades meant that portraits, hitherto mainly the preserve of the aristocratic members of society, were commissioned by wealthy members of a new and burgeoning middle class. Although the conventional studio backgrounds to portraits were still used, sometimes the workshop or the office was employed as a setting by the more confident sitters for their portraits. They were proud of the lucrative businesses they had built up.